CASE STUDY: How CouponDunia started in 2010 became leader in the Couponic industry? Home > Blog > Blog > CASE STUDY: How CouponDunia started in 2010 became leader in the Couponic industry? 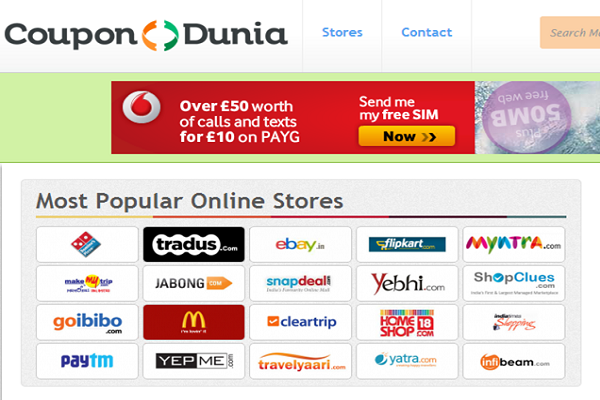 CouponDunia is number #1 couponic website in India. It helps users in saving money through various coupons, offers, deals and discounts. CouponDunia provides coupons and deals for categories ranging from shopping, fooding to travelling. CouponDunia provides deals for smart shopping. Its mobile app sends live deals and discounts to its customers when they are near a store. Sameer Parwani, the founder of CouponDunia, while pursuing his bachelor’s degree in computer science from Cornell University, in 2003 developed a website named RateDesi.com, a social networking site for the South Asian community residing in the US, UK and Canada. Though the company didn’t promote itself as a commercial product, the company gained a huge network of 3.5 lakhs registered users. As his study got completed, he started working for PricewaterhouseCoopers as an information security consultant in New York and worked there till October 2006. Then moving ahead he again founded his own company, Tysam Networks, for college students but quit the company in April 2008. Then he started freelancing and completed many projects and finally after a year and a half he left freelancing to start his career as an entrepreneur. Sameer started CouponDunia from America to offer deals and discounts for Indian customers dealing in shopping, travelling and fooding. The website was already in action when Sameer packed his bags to move base to India. CouponDunia works on a simple model based on commission. The company sends users to the targeted website and on each successful purchase; the company pays some percentage of the sale as commission to CouponDunia. By March 2011, the company had a turnover of Rs.1 crore with a net profit of Rs 20 lakh. At that time, nine people were working for the company. Then in mid-2012, the firm received a funding of Rs 1.2 crore and expanded its services to other countries including Indonesia, Poland, Brazil and Turkey. Expanding more, the company opened offices at seven places in India including Delhi, Bangalore and Pune. CouponDunia receives more than 2 million monthly visitors and serves coupons from more than 2000 online brands. Most of the users are from the age group of 25 to 31. On an average, CouponDunia is creating transactions of Rs 500+ crore. Currently the company is operational in seven Indian cities and is planning to expand to more cities soon. Similarly, it has rolled out the FMCG offline segment in Delhi, Bangalore and Mumbai, which it will expand to other cities as well. CouponDunia is doing 20k transactions on a daily basis which is giving a sign to increase in the coming days. On a monthly basis, the company is witnessing about 5 million visitors over the web portal. Similarly, its app launched in Nov 2014 has witnessed more than 5.1 million downloads. CouponDunia is wholly based upon online marketing. All its offers and deals are offered through its online portal. Every business and every industry has now moved toward online business. When businesses have moved then why not the customers? This is the reason CouponDunia has targeted those customers who use internet as their source to shop, travel and dine. Talking about advertisement of the brand, the company has used SEO, SMM, PPC, display advertisement, social media marketing (Facebook, Twitter, YouTube, Instagram), email marketing, to promote itself and reach out of the box. To look at the social media fan page on Facebook, the brand has a huge fan following of 5.7 lakh people. Currently gets over 9 million users per month combined on app and website. Market Value (GMV) of $166 million per year. Company is operating in seven cities including Ahmedabad, Delhi-NCR, Pune, Bangalore, Mumbai and Chennai. Partners with 5,000 restaurants, 12000 retail outlets and 2000 online stores. Sameer Parwani (Founder), before graduating from Cornell University, had already co-founded a site with more than 350k registered users.